In May 1989, my newly-wed husband and I quit our jobs in Ohio and moved to the "promise land" of St. Petersburg, Florida. We left all of our family, except Bob's parents, all of our friends, our schools, our colleges, and everything we had always "known" since birth. We arrived excited about the weather, my transfer to the Tampa office of Arthur Andersen & Co. and the prospect of Bob getting into business for himself. Anyway, I scrolled around on the radio dial and heard a clear voice listing the sponsors of the radio station; St. John's, St. Raphael's, St. Paul's, Blessed Sacrament. What kind of station could this be? I left it on and was pleased to find out that it was 90.5 FM, WBVM, the Catholic Radio Station of the Diocese of St. Petersburg. Some of the features from those early days were the praying of the Rosary and Divine Mercy Chaplet. Msgr. McNulty did a Respect Life segment. Fr. Eric Peters did a segment that ended "And Remember, Jesus Loves You!" Anetta Wallace did a regular piece about parenting and the tag line was "Parents are Partners with God in Loving." Johnnette Benkovic and Sr. Ann Shields were on in the early mornings. The format change in 1997 ushered in Christian Music. Gus Lloyd was a morning show host, then Big, Big, House Morning Show started in 2008. But through all these years one thing has stayed the same. Spirit FM has brought HOPE. It brought HOPE to me as a 24 year old, moving away from friends and family. It brought HOPE to me in the late nights and early mornings when my babies would wake up and need feeding. It brought hope to me when my kids were pre-teens and teens, that there was a music station that we could ALL listen to. Spirit FM is doing their annual fundraiser. They need all of us to help bringing HOPE. Won't you join me in giving HOPE back to a station that has given so much HOPE? You don't have to wait till September, Click HERE to DONATE NOW! 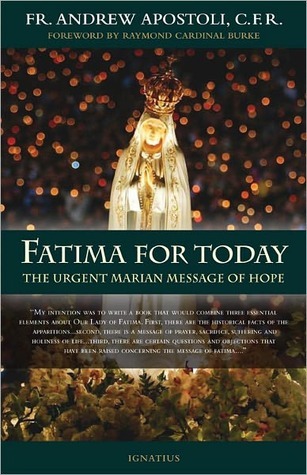 This summer I read a most wonderful book Fatima for Today-The Urgent Marian Message of Hope by Fr. Andrew Apostoli. Our parish priest, Fr. Corona, had recommended it and so a dozen of us got a copy, read it and met to discuss it. I had heard a lot about Fatima before. I have always prayed the Fatima prayer at the end of each decade of the rosary. I knew about the three little children. I had heard for years about "the mysterious third secret." But this book really shared so much more than just the historical details. As a convert to the faith, I have had very little exposure to Mary. Through this "can't put it down" book, I realized he wants us to be closer to His mother. He draws us in one baby step at a time. Because of this book, I began dedicating time daily to the Rosary. I did not realize how our prayers, with Mary's intercession, can affect the lives of so many around us. We CAN affect the salvation of souls. What an awesome revelation. The most profound thing I learned is this, "God made us without us, but he will not save us without us." We must do our part by prayer and sacrifice. What struck me most about the Fatima book is the power of prayer. I also learned more deeply about offering up your pain and how it can profoundly help other people. The main high points from our discussion was that reading the book unanimously drew us closer to our Blessed Mother, daily praying the rosary, a deeper understanding of the apparitions of Fatima within the context of the historical climate then and how it’s message is still urgent for us today, and finally the first Saturday devotion (a brief overview below). Right at the end of our discussion group gathering-the door bell rang. A large package was delivered to my home which contained a beautiful 2 ½ ft statue of our Blessed Mother that I had ordered over 2 weeks ago and my other statue broke. I couldn’t believe the timing! Fr Dominic was there to bless the statue. If you like to learn by listening, I suggest this talk by Fr. 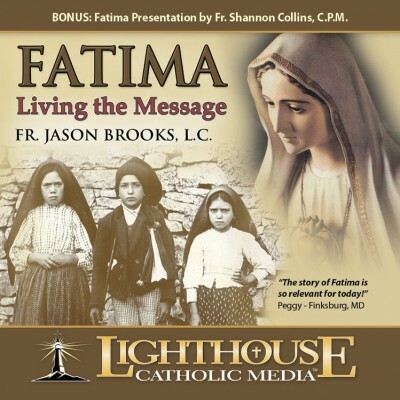 Jason Brooks: Fatima-Living the Message! Today we celebrate Mary as our Queen. She receives this title because Jesus is our King and she is the Queen Mother. Mary's queenship is contemplated in the fifth Glorious Mystery of the Holy Rosary. After she was assumed into Heaven, body and soul, she reigns as Queen of Heaven and Earth. 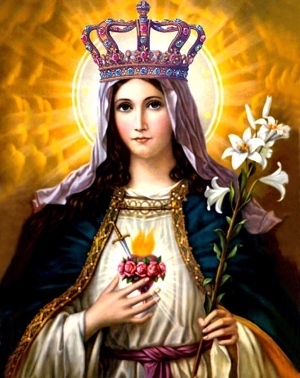 Today pray the Hail, Holy Queen prayer and ask Mary to be your Queen and lead you closer to her son, Jesus. Hail, Holy Queen, Mother of mercy, hail, our life, our sweetness and our hope. To thee do we cry, poor banished children of Eve: to thee do we send up our sighs, mourning and weeping in this vale of tears. Turn then, most gracious Advocate, thine eyes of mercy toward us, and after this our exile, show unto us the blessed fruit of thy womb, Jesus, O merciful, O loving, O sweet Virgin Mary! R. That we may be made worthy of the promises of Christ. Amen. SALVE REGINA, Mater misericordiae. Vita, dulcedo, et spes nostra, salve. Ad te clamamus exsules filii Hevae. Ad te Suspiramus, gementes et flentes in hac lacrimarum valle. Eia ergo, Advocata nostra, illos tuos misericordes oculos ad nos converte. Et Iesum, benedictum fructum ventris tui, nobis post hoc exsilium ostende. O clemens, o pia, o dulcis Virgo Maria. V. Ora pro nobis, Sancta Dei Genitrix. R. Ut digni efficiamur promissionibus Christi. Abby and the Mom's Squad want to know how to balance family life and personal fitness. Ask any of my friends and they will tell you I am no super athlete, nor am I consistently good at exercising, but I have learned a few tricks over the years and would love to share. 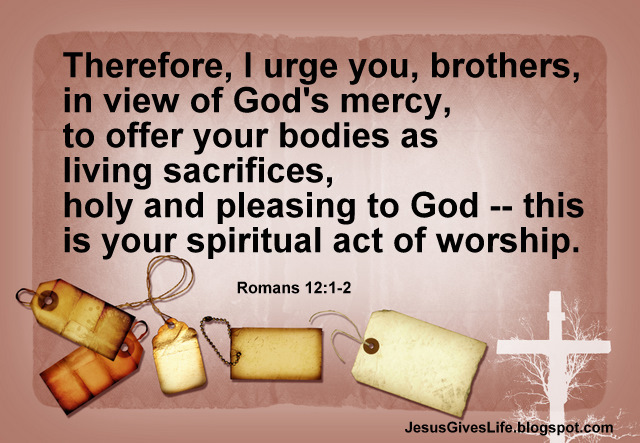 Although these two verses may seem to contradict each other, I think they highlight two sides of the same coin. 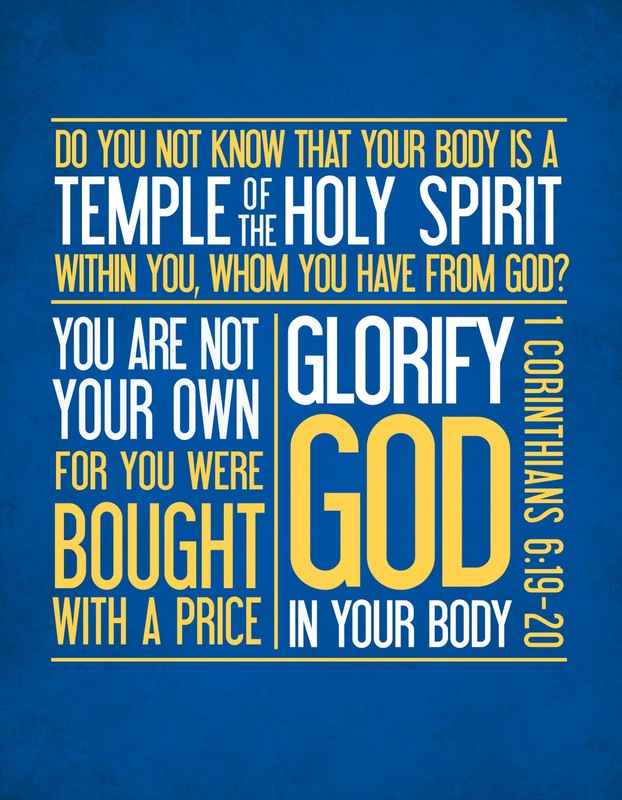 On one side, our bodies are temples, they have been given to us by God and we need to protect them, keep them clean and maintain them so they are in great shape! 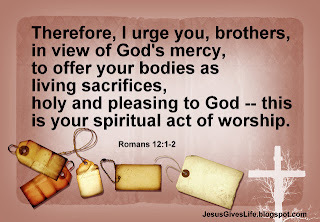 On the other hand as we see in Romans 12:1, we are called to give ourselves bodily, as a sacrifice to God, which is actually worship. I see this as giving totally with my body to the tasks and vocation to which God has called me: raising our children, serving our family, providing for our household. And sometimes this means I give up any "me time" for the good of others. So it has to be both/and. And therein lies the struggle. As a mother, it is hard to balance the demands of the husband, children, household and work with your own personal bodily needs and "maintenance." I know I have to be healthy in order to keep up with vocation and daily responsibilities, but how do I fit it in? 1. First off, there are some "seasons" of your life that it is easier to do it in than others. Pregnant, brand new baby, or nursing? These seasons may be hard to give as much time to yourself. Toddler, no babysitter? This time too is hard. But as the kids grow the "seasons" change, so don't despair. there will be a time that you can get it in much more easily. Although when you are pregnant or nursing, it feels like it will never end, it does. And so don't loose hope! 2. Be (more) content with your body in general. God created you and gave you your body he gave you your family history, your predisposition to weight and all that makes you up physically. In America, we pretty much think God got it wrong if we are not 5' 9 and 110 lbs! But that is our crazy consumer/advertising culture. So don't compare yourself with supermodels, or even with friends or co-workers. Be realistic about yourself and realize that God loves you just as you are. First off, Pray! 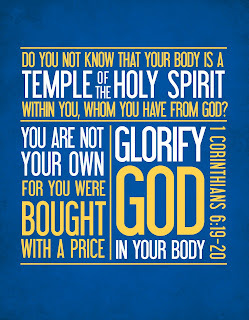 Ask the Holy Spirit to give you the fortitude you need to make your desires a reality. Ask our Lord to help you see each day as He sees it and enlighten your mind to find the ways to make exercise and healthy eating part of each day. Get a fitness partner- accountability helps so much to make us go forward on our good intentions. TURN OFF THE TV. If you are watching even as little as 3-7 hours of total TV a week--there is your workout time. Find the windows that you do have for exercise and don't focus on what you can't do. Maybe in college you ran marathons and now with the kids you can 't. But can you run 30 minutes 3 times a week? That is a positive, focus on that. A LOT Of exercise takes place each day by all the chores and child care we moms do. Don't discount all the lifting of the baby instead of lifting weights, or pushing the vacuum or mopping the floor. Also bike riding with the kiddy seat on back or walking with the stroller is very positive. Get up early--I know this is painful. But I know if I want anything to happen in a given day, it has to be first thing. Too many things come up mid day or in the evenings that I don't plan, that thwart my exercise. 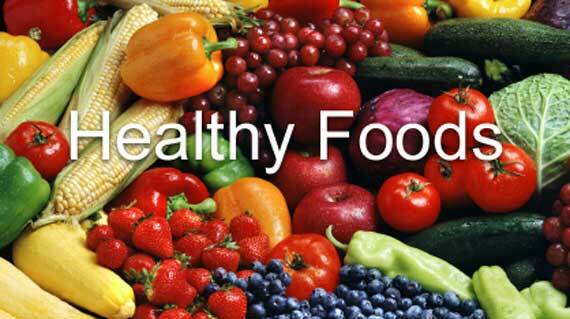 Make healthier food choices, at every meal. Decrease the portions, pick the salad instead of the chips. We all know what we should eat. Just make the right decision one meal at a time. Bottom line is, it is never easy to balance it all. It is like the circus guy spinning the plates. If you have don't give attention to each plate, or if you have too many plates you are trying to spin, one of them is bound to fall. But if you get the right number of plates and give even a little spin to each plate regularly, they will all keep going. If you want to make exercise a part of your life, you have to plan it and make it happen and then be ok when you fall short. You know that I TRY to get exercise at least 3-4 times per week but doesn't always happen! For me, it is just habit and makes me feel much better and think much clearer. So, I make the time to do it. And, if I miss I don't get upset or beat myself up about it. Just do better the next day! I think physical fitness and prayer life really are similar, I need both daily and both take time and commitment. It's easy to get off track with either, but I just pick up and keep going! I consider exercise similar to the spiritual life. First off, you have to make time for it, it just won't happen on it's own. Second, it takes a lot of practice and continually training in order to improve and to enjoy it more. Third, it's not an option, Just do it! Being a working mom of three kids, with at times, three different schools to coordinate, my schedule can be really full. I believe that exercise not only makes me feel better and stronger but it helps me sleep better and it makes me a better mom and wife. I feel happier and healthier when I get a good workout in, I seem to have more patience and get less stressed when I exercise. Exercise clears my mind and makes me more productive both at home and at work. The key to exercise as a busy mom is dedication and flexibility (in my schedule, not my limbs ;o) ) if I dedicate myself to exercise and allow for flexibility in my day then I can always seem to fit in a workout somewhere in the day. I also change up my routine so as not to get bored. I mix it up with power walking, weight lifting, paddle-boarding, and spinning. My biggest excuse was that I have my three-year-old and don't have time to work out. When I finally got serious about doing something to workout, I found a gym where I could I just bring him with me. He loves to go. He has made friends with other little kids there. Where I go it is a warehouse, not a gym. They have daycare but it's not a super kid friendly place. I just had to stop making excuses and finally do something. If you want to badly enough, you can make any situation work there really is no excuse why you can't work out. As my friends and family already know, I LOVE Chick Fil A. Ever since David Neely opened the Fourth Street Restaurant in St. Petersburg, I have been a "regular." I know all the staff by name, my kids grew up on their playground. I have used Chick Fil A as a reward "hey kids, anyone who goes to 8 am mass with me tomorrow gets Chick Fil A breakfast!" I crave the chickin' minis. I joke that the ice tea must have crack cocaine in it because I am addicted to it and want it all the time and often buy it by the gallon. There has been much written and discussed about Chick Fil A Appreciation Day August 1st. It was great to see so much support not only for traditional marriage, but for the local business owners who make good chicken and have great restaurants. But when it is all said and done, I am so happy that I now have my own theme song. Ok, this cool guy Tim Hawkins wrote it and sang it, but it is from my heart. Hope you laugh as you watch this. And believe me, I could eat there seven times a day. Monday we drove a truck to Tallahassee to help our oldest son, Bobby move from a rental house to an apartment. At the rental house, one of his housemates had brought the majority of the furniture and kitchen appliances, so last year's move-in was relatively easy. This year our second son, John, will be starting college at FSU with Bobby and they will share an apartment. So now it's all Musselman-meaning the boys need everything- and it's all coming from our family's resources. We have been completely blessed in finding free and cheap stuff and so Sunday we gathered it all up and got the move started for the August 1 deadline. As we unloaded, unpacked, cleaned up, set up and got the apartment looking great, I suddenly remembered how many times my mom had helped me in moving and other physical labor. It would be impossible to count all of my dishes she washed, my laundry she folded, my furniture she moved and arranged, my cupboards she cleaned out and even the back yard grass she helped plant at our first home. And now here I am doing some of the same. How blessed I am to carry on in her footsteps! Then as we returned from the big move, our 10 year old daughter kept saying her stomach hurt. Yeah, yeah, too many chicken nuggets, right? Wrong. In the middle of the night she knocked on my door and then proceeded to vomit all over the floor, the hallway and the bathroom, UGH! As I got her calmed down and was cleaning up the mess, again, I thought of my mother. How many midnight messes did she clean up? I looked at the clock, and it said 4:17 am, I felt she was definitely "with me in spirit" because her birthday was April 17 (4/17. ) I lifted my heart in prayer, to her, with her and said "hey thanks Mom! Thanks for being such a great example and for all you did for me! Sorry I probably didn't thank you enough when you actually did these great things for me." God also gave me the grace to see and mark the milestones in our children's lives. In the early days we cheered when they got potty trained and learned to ride a bike. Now we also cheer as they sign their own lease, and arrange for their own power, light, water and cable! The blessings of motherhood continue, what a great ride!